"Dangerous at both ends and crafty in the middle." A New Yorker born and raised, creativity has always been a part of Aisha's life and is, in fact, in her blood. The daughter of an artist and museum director, Aisha picked up a pencil before she learned her ABCs, learning to draw at her mother's knee and "borrowing" art supplies from her mother's drafting table when she grew tall enough to reach. Her love of art has only been matched by her love of books, becoming a voracious reader at an early age after falling in love with the written word after her first taste of Green Eggs and Ham, and becoming a published author by the time she was nine years old. Her passion for art and books helped shape Aisha into the illustrator and graphic designer she is today. Her love of fantasy and pop culture weaves itself into her life and her work. Aisha graduated from the Fashion Institute of Technology with a degree in Illustration, and prides herself on her unique style in all her endeavors. With several years of experience under her belt, Aisha currently works as a freelance designer, creating book covers and promotional images for independent presses, publishing houses, and self-published authors. 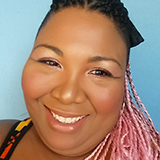 In her spare time, Aisha illustrates for fun and profit, crochets gifts for friends and family, plays mom to a slightly evil and completely ridiculous cat, enjoys table-top gaming, and is a harcore kpop fan. To learn more about what Aisha can do for you, please see her offered services and read testimonials from satisfied customers.